Creative Inspirations Challenge 37-Christmas Card & Tag Set! Supplies: Cream Card Blank 5 1/2" X 6" Halcraft, Papers: Stampin Up-Soft Suede, Rose Red Very Vanilla, olive and patterned paper from my stash, Stamps: See D's-#50319 Christmas Messages, PrintWorks Clearly Defined-Q021 Celebrate Christmas, CTMH-D1177 No Peking, C1291 Gift of Love, Ink: VersaMark Ink Pad, CTMH-Z2137 Olive, Stampin Up-Soft Suede, CTMH Gold embossing powder, Koh-I-Noor Watercolour Wheel stack pack, Stampin Up-Clear embossing powder, Stampendous-White embossing powder, Sharpie Paint Pen-Gold, Scrap Essentials-Metallic Metal Rim Tags, Marvy-small circle punch, EK Sucess-1 1/2" circle punch, ribbon-Offray,Celebrate It Michael's, small red metallic brad, glue dots. Very pretty card!!! I love the texture on this!!! 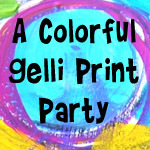 Nicely done...I recognized your sketch right away, as I just made a card using the same one! The tag is pretty too! Thanks for playing along with us this week! What a gorgeous pair!! 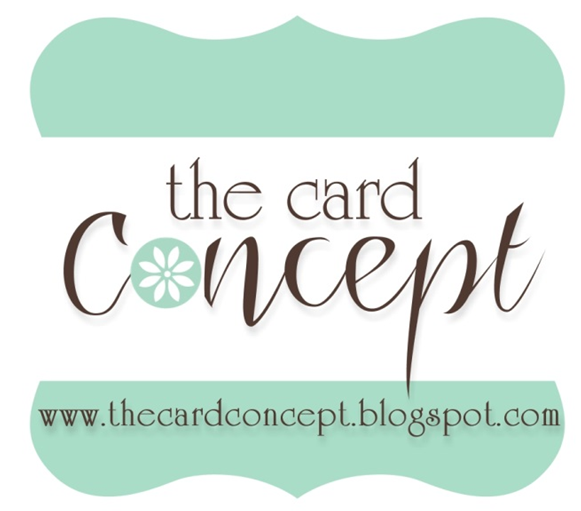 The tag is a perfect match to your beautiful card!! Love the flowers,textures, and colors!! Thanks for playing with us at the Sat. Spotlight!! 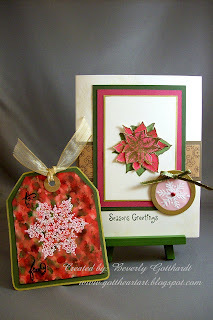 Oooh love the pointsettia but LOVE, love, love the background for your gift tag. Very beautiful. Ooooh, pretty! Thanks for playing along this week with the 411! Beautiful card. So crisp and clean. I love it. These are so pretty.. I love the tag and card both.. Great job.. Thanks for joining us at Saturday Spotlight. So pretty!!!! I love the polished stone on the tag. 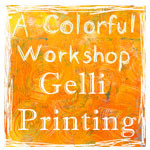 Great job with the Stamping 411 sketch challenge this week! Thanks for playing! What a pretty card!! Thanks for playing along this week!! Lovely set that you will be giving to someone. Your gold embossing is so pretty. This is just awesome. I love seeing the details! 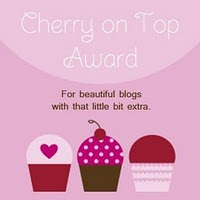 Congratulations on being picked for the top 5 over on the 411 blog. Well deserved.